Or is your dog actually uncomfortable? In my work with high-energy dogs, I teach a lot of dog sports, with a strong emphasis in focus work. I stress the importance of teaching dogs to focus on their owners instead of the exciting world around them. Yet many people misunderstand what is focus, and more importantly, what is motivation. 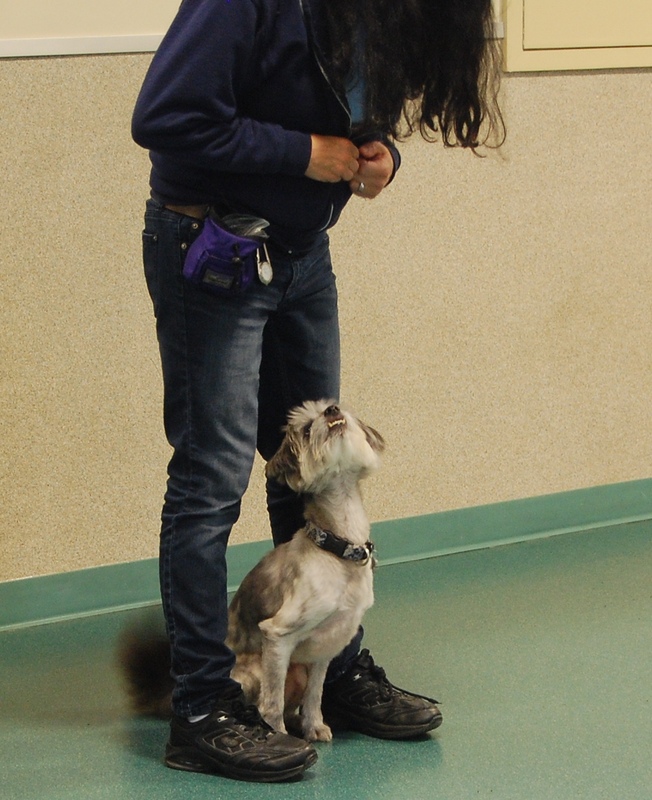 Noted competition dog trainer, Denise Fenzi teaches courses specifically on the topic of training dogs to have high motivation for sports and work. She understands what drives dogs, and how to get them to focus. And she also notes that in many situations where a dog is not focused on his handler, there are often good reasons. When anyone tells me that they have a “stubborn” dog, I am quick to say that their dog is probably just “insufficiently motivated”. This is really what is at the root of many training challenges, regardless of the methods that are being employed. It may be that the dog is more interested in something other than the handler, it could be that he is nervous or distracted due to an overly stimulating or new environment, or there could be other, more serious reasons such as fear, discomfort, or even pain, that may cause a dog not to respond to a handler’s cues. Ready for the next cue! In the most extreme example, I had a student with a lovely German Shepherd mix that bit a veterinarian who pushed down his behind for refusing to sit on cue because, she said, he was just being stubborn. After a switch to a different veterinarian, the owners learned that he had severe hip dysplasia. Thus, he was not being stubborn when refusing to sit on cue, but he was refusing because it actually hurt to sit! With my own dogs, I keep a close eye on their comfort levels when we are training, or even just out and about. If, for example, I have asked one of them to“heel” and she spontaneously switches sides on me, rather than reprimanding and forcing her to go back to my left side, I instead look to my left and invariably find the object of her discomfort – often a large barking dog or frighteningly loud garbage truck or some such thing. By allowing my dog to switch sides, I am not only respecting her feelings (i.e. fear) but also giving her the option to take refuge behind me. Respect for your dog is about recognizing that, often, a misbehaving dog is doing so due to misunderstanding or even discomfort rather than actual stubbornness. As world renowned trainer, Kay Laurence, insists, even jumping up on you could be a call for help or approval, and not just a rude plea for attention. My own dogs know not to jump up on me uninvited, yet I will not reprimand them for jumping up on me when I recognize signs of stress.. So the next time your dog refuses to respond to your cue, rather than assuming him to be stubborn, consider what else may be going on. Then change your tactic; increase your motivator, change your cue, or give your dog a break if he needs it. This entry was posted in Dog Behavior, Dog Training Tips, General Dog Info by M Cecilia Sternzon. Bookmark the permalink.